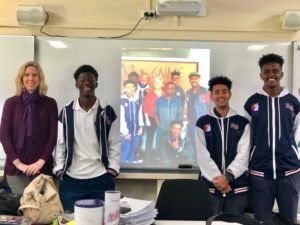 This term, Year 12 students, Ajaypal Singh, Robert Kollie and Temesgen Gebremichael were selected to act in a mentoring role with our school's new partnership with Roots TV. Roots TV is a community-based not-for-profit, media empowerment program supporting young people to create and distribute films about their visions for a more just and sustainable world. The students collaborated on a short film called "54" with students from Balga Senior High School which explores the serious issue of credit card fraud. On Friday 8 August 2018, this short film was shown to the community at the Herb Graham Recreation Centre in Mirrabooka, where a number of school leaders and Western Australian Police representatives were in attendance. As part of this project, our students also recently took part in a radio interview on Noongar Radio 100.9 - the largest indigenous radio station in Australia. Robert has subsequently been offered a volunteer position at the station. These students have also been put forward for a short term paid mentoring contract through MercyCare.